In 1996 Scientific AmeriKen tested the abilities of science to freeze ants in an effort to later wake them up (Click here to view). 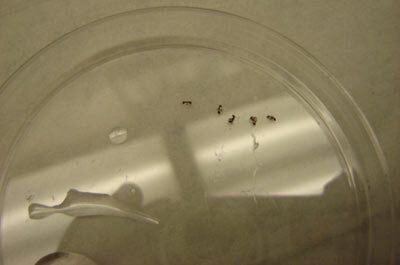 Unfortunately, 15 ants perished in the experiment proving the technology of the time to be inadequate. Ten years later, with access to larger and more powerful equipment, Scientific AmeriKen will attempt once again to test the limits of technology and advance the field of ant cryogenics! 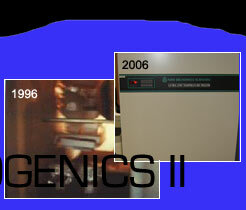 With access to new equipment, the new Scientific AmeriKen has a decided advantage over the experiments done 10 years ago. Items such as a powerful -80 degree C freezer (compared to ~20 degree C) and a glycerol/water mix instead of just water may give the ants a chance for survival. 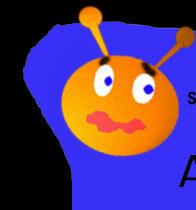 However the ant organ systems may be too complex to handle such shock. Although glycerol/water mixes allow bacteria to survive and be revived months after entering the deep freeze, it is the hypothesis of this experiment that the ants will not survive these conditions. 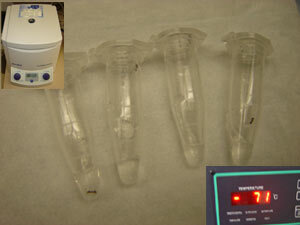 Used in this experiment were 5 ants, 1 -80oC Scientific Freezer, 100% Glycerol, H2O, Eppendorf Benchtop Centrifuge, and 4 1.5 ml Mini Centrifuge tubes. The first step is to mix the ants with glycerol. Due to an oversight, 100% glycerol was used. To mix the ants a desktop mini-centrifuge was used. 2 drops of glycerol (~100 ul) was added with 1 ant to a 1.5 ml mini centrifuge tube. The ant was then spun into the mixture at 20,000g for 10 minutes. Ants were then immediately placed in the freezer for 30 minutes. 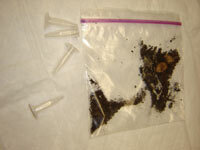 Ants were then removed from the tubes and spread out away from the glycerol and observed for signs of life. Before further experimentation could be done, the ants had to be tested for their survival of the centrifugation process. The Ants were centrifuged at 20,000g for 10 minutes and all 5 ants survived the process. A movie taken of the ants immediately following the process can be viewed by clicking here. Picture above shows ants following the freeze and thaw process. Although no video is available to capture their movement, for all intensive purposes, this could be considered as a movie clip. The hypothesis was proven right and the methods presented here have failed the ants. However, this study stands as a brief introduction to the new technology that could be used to usher in the new era of ant cryogenics. Future experiments will feature Several controls that should have been in place to test whether ants could survive the glycerol process and at what percentage of glycerol to water. Also to test the tolerance to the cold temperatures of the freezer without the aid of glycerol. It also should be stated that this experiment has begun to demonstrate the ability of ants to survive high speed centrifugation. Finally, it should be stated that the door has opened to a host of stronger technologies that the new facility can offer such as liquid nitrogen, dry ice, vacuum sealing and much more the could be used to further mankind's knowledge of cryogenics!